Yesterday I reviewed the revised Arden 3 edition of Othello on amazon.co.uk, mainly to talk about the deficiencies of the Kindle version. Kindle isn't yet up to representing books with complex layouts like the Arden editions. A pity, because I rather fancied carrying around the complete Arden Shakespeares on my smartphone. Laura pointed out another aspect of Kindle publications that I hadn't really grasped before. If you buy the Kindle version of a book, you can't lend it to anyone when you've finished reading it. For her, as for a lot of readers, part of the joy of reading is sharing favourite books with friends and family. I accept it isn't easy for publishers to make money any more, but in this case the basic Internet-Age economic principle that everything tends to become free is actually being counteracted by a new level of product policing. Nevertheless, Kindle definitely has its uses, and one of them is (as an author) to self-publish and (as a reader) to have easy access to obscure works that, were you to buy them in book form, you suspect would get trapped for ever on the bookshelves at home, where you never spend any time yourself. But I've read David Bircumshaw's book on my smartphone in coffee-bars, on trains, on grassy hillsides, in canteens and on toilets. My critical faculties have been asleep while I've been reading it, so I'll only suggest that The Ghost Machine is funny, intertextual, self-referential and will probably appeal to fans of gillibrand and molesworth 2. Each page is its own semi-self-contained sketch. Here's page 55 (of 115). Q. What happened to Flaminus and Curzon? Ed. Unfortunately the development of the duo was cut short by their transmogrification into certain personnel of The Rock Garden. Q. 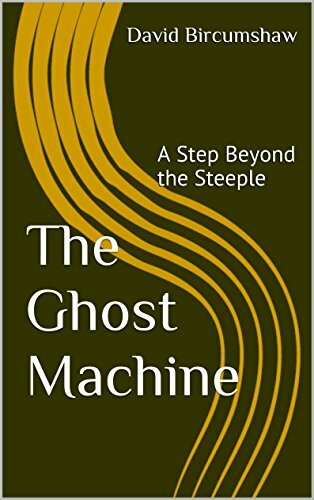 What literary influences are there on The Ghost Machine? Ed. Many. Obviously a kind of semi-Shakespearian blank verse (see O'er the Top); Beckett - The Rock Garden; Bone; Dostoevsky - Bone again, closing lines; Milton, vide Mollock's speech; The Dunciad (e.g. the final paragraph of the A.G.M. ); Stanislaw Lem, viz. the Editor's Prologue and The Ghost Machine Another Dimension; Alisdair Gray - just about everywhere; pulp science fiction (The Dome); metaphor-soaked or soused poetry, e.g. Rilke of Mallarmé - The Dome once more; James Joyce - the use of parodic narrators or wayward catechisms as in the A.G.M. and From Our Crime Correspondent (the former) or this page (the latter); Peter Reading and Sue Townsend (! ), vid. the poems and diary of EE; and Flann O'Brien (prevalence of bicycles). Q. What is the purpose of The Ghost Machine? Ed. Consumption of paper. Eating of time. Postponement of the inevitable. Disingenuous fabrication of maps. Q. Is the author assured of his ultimate purpose? Ed. Categorically, no. In reality, a word he shuns, he is lesser than any of his creations and venges his spite on them for his innumerous shortcomings. Q. Is there any way out of The Ghost Machine? Who asked the last three questions, Leeds. Ed. Closing the book. Blanking the page. Escape into humanity. The re-ordination of a four-letter word: love (ugh! - The Author). As for your implied second question, the answer lies with our variously capitaled author himself. Q. What hope do you have for the future of the book? Ed. To my mind much depends on Bone and Ms EE. Q. To The Author - why are you asking so many questions? Author - I don't know - I just need to talk sometimes. EDITOR REQUIRED for Ghost Machine. Urgent vacancy owing to attack of unforeseen resignation. Apply - The Author, 5, Hangover Square. I like the sound of it, and while skimming through your excerpt was reminded of the Catechism, James Joyce and Flann O’Brien (who was influenced by the other two). Reading it a little more slowly, was then gratified to see that these were all mentioned in Bircumshaw’s text. I like your thoughts on Kindle books, making money & so forth. My own publishing plans must for practical reasons exclude the printed book, as I need too many pages & colour photos. Since it is possible to read blogs and e-books with equal ease on portable internet-connected devices, it seems increasingly overlapping & redundant to consider these two media as different realms and never-the-twain-shall-meet. Wordpress even in its free edition offers inspiring possibilities. Kindle is a bit peculiar as there are so many versions, mine being one of the oldest, & the Word template I use to edit for Kindle takes its quirks into consideration. I wouldn’t mind offering my eventual book—“The Cycle of Imperfection” or whatever damn-fool title I come up with—free of charge. But the snag is, it wouldn’t get read because it wouldn’t have been promoted. So my main problem with DIY is not the technical considerations but in the realm of publishing & marketing (aren’t they the same thing nowadays?) What I really need is a trip to London to meet my as-yet imaginary agent in some high-class restaurant where a sensible plan would be made, whose by-product would be the invention and launch of a landmark event in the history of literature: a volume more accessible than Finnegan’s Wake, les controversially memorable than Waiting for Godot. I was 13 when that came out. Everyone, it seemed, was talking about it. Back to The Ghost Machine and not being able to lend Kindle books. My local library lends e-books but they aren’t in Kindle format. I have the software to unlock them, translate them to mobi and keep them forever. Unfortunately they don’t have The Ghost Machine.